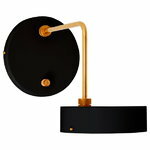 Made By Hand's Petite Machine 02 wall lamp features a pipe that turns to both sides in a 90-degree angle. The beautiful Petite Machine lights were the Lindholdt brothers’ first items designed for serial production. The designers draw their inspiration from the 30s, 50s, 80s and the present time, which reflects from the elegant and playful shape of the lamps. Petite Machines were created as modern classics, and they combine modern technology with traditional craftsmanship and human touch. The stylish brass leg and the pleasing hues of the round shades add undeniable style to any home. Studio Flemming Lindholdt is a Danish design studio whose motto is ‘room for everything except compromises’. This summarizes Flemming Lindholdt’s designs and the way he works: his designs are uncompromising and playful with a strong focus on quality and functionality. Studio Flemming Lindholdt wants to design objects of extraordinary quality that push the limits of global and Nordic design – a great example of this is the beautiful Petite Machine lamp.